It’s time for Makeover Monday – Week 2. 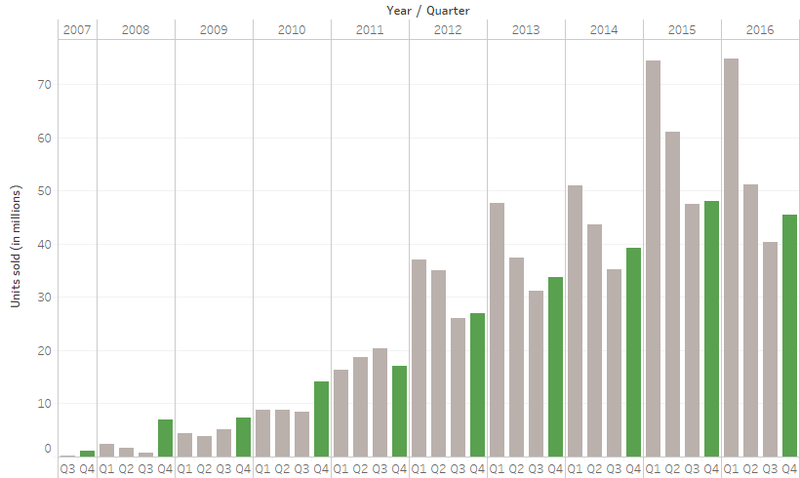 This week’s data set was the quarterly sales (by units) of Apple iPhones for the past 10ish years. The original article accompanying the data indicated that the golden years of Apple may be over. So let me start by saying – I broke the rules (or rather, the guidelines). Makeover Monday guidelines indicate that the goal is to improve upon the original visualization and stick to the original data fields. I may have overlooked that guideline this week in favor of adding a little more context. 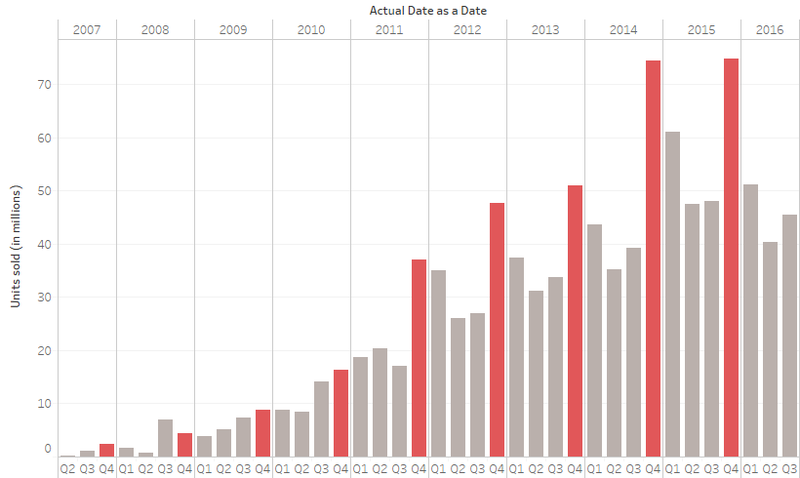 When I first approached the data set and dropped it into Tableau, the first thing I immediately noticed was that Q4 always has a dip compared to the other quarters of the year. This view contradicted all of my existing knowledge of how iPhone releases work. Typically every year Apple holds a conference around the middle/end of September announcing the “new” iPhone. That can either be the gap increase (off year, aka the S) or the new generation. It lines up such that pre-sales and sales come in the weeks shortly following. And in addition to that I would suspect that sales would stay heightened throughout the holiday season. This is where I immediately went back to the data to challenge it and I noticed that Apple defines its fiscal year differently. Specifically October to December (of the previous year) counts as Q1 of the current year. Essentially Q1 of 2017 is actually 10/1/16 to 12/31/16. Meaning that in the normalized world thinking about quarters, everything should be adjusted. Now I was starting to feel much better about how things were looking. It aligned with my real world expectations. I still couldn’t help but feel that a significant portion of the story was missing. In my mind it wasn’t fair to only look at iPhone sales over time without understanding more data points of the smartphone market. 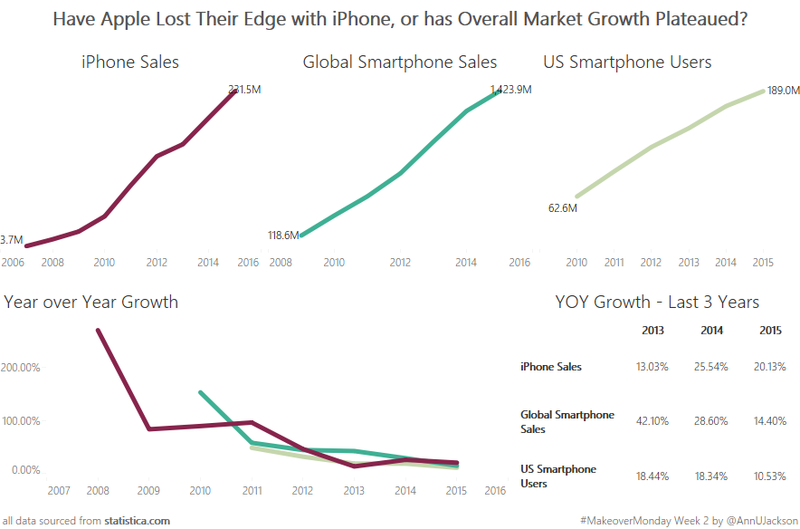 I narrowed it down to overall sales of smartphones and number of smartphone users. The idea I had was this: have we reached a point where the number of smartphone users is now a majority? 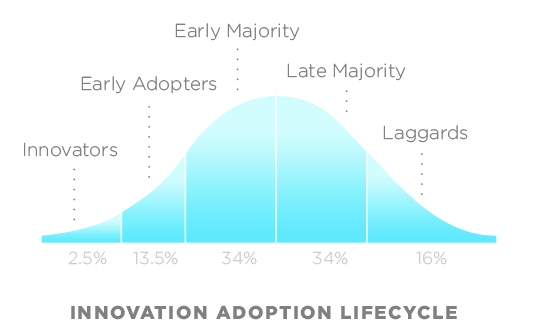 Essentially the Adoption Curve came to my mind – maybe we’ve hit that sweet spot where the Late Majority is now getting in on smartphones. To validate the theory and keep things simple, I did quick searches for data sets I could bring into the view. As if through serendipity, the two additional sources I stumbled upon came from the same as the original (statistica.com). I went ahead and added them into my data set and got to work. My initial idea was this: line plot of iPhone sales vs. overall smartphone sales. See if directionality was the same. Place a smaller graph of smartphone users to the side (mainly because it was US only, couldn’t find a free global data set). And the last viz was going to be a combination of the 3 showing basic “growth” change. That in my mind would in a very basic way display an answer to my questioning. I went through a couple of iterations and finally landed on the view below as my final. I think it sums up the thought process and answers the question I originally asked myself when I approached the data set. And hopefully I can be pardoned (if even necessary) since the accompanying data added in merely enhanced information at hand and kept with the simplicity of data points available (units and time).